Is there a name for the pattern of matching two things by using a line to connect them together? Source: This product page on Amazon found at random through image-search (no affiliation). Because you mention school, I just wanted to add that this was always called a "mix-and-match puzzle" in my classes. This would specifically mean the words, and definitions, are purposely jumbled to create a puzzle. For your purposes, however, I wouldn't use this term because it would imply it is a game. 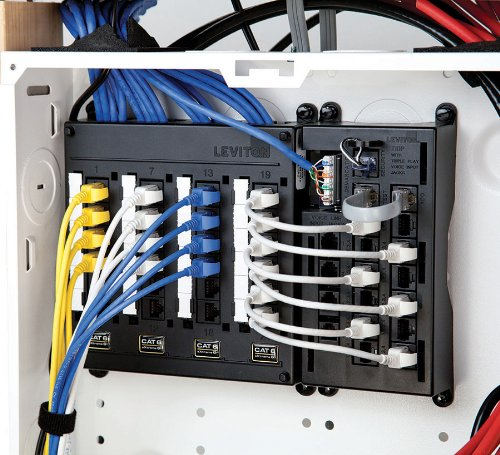 I second the "patch panel" in this instance, as that makes it clearer that they are simply making choices in format. A little more explanation of the terminology on Etymology SE Where does "patching through" come from? The "line to connect from one side to another" with all sorts of crazy diagonals depending on exactly what is needed, fits a telephone switchboard precisely. That is actually more than with a typical modern network patch panel where many technicians will try to wire things up, at least initially, so that most patch cables are straight (horizontal or vertical) instead of jumping all over the place. This is a "Word-Definition Matching Widget"
I think there isn't an easily findable name for this pattern because it doesn't translate to the web very well. I'm trying to imaging what the responsive mobile version would look like and I can't. You could also dub it "Pairing Pattern" (or "matching pairs" as said by @Rahul). Since you are linking pairs of elements from two sets. name for top-of-page informational messages? UI pattern for shared editing scope among selected elements? What pattern is used on LinkedIn's profile strength meter?